A stye — also called a hordeolum (pronounced hor­dee-OH-lum) — often appears as a red, sore lump near the edge of the eyelid. It is usually caused by a bacterial infection. A stye will develop at the base of an eyelash if the eyelash follicle (root) is infected. This is usually called an external hordeolum. A stye will also develop if there is an infection in one of the tiny lubricating oil glands (called meibomian glands) inside or under the eyelid. When this occurs, it is usually called an internal hordeolum. A stye can also be caused by widespread inflammation (swelling) of the eyelid from blepharitis, a condition that affects the eyelid margins. A chalazion (pronounced kuh-LAY-zee-un) is an enlargement of an oil-producing gland in the eyelid called the meibomian gland. It forms when the gland opening becomes clogged with oil secretions. It is not caused by an infection from bacteria, and it is not cancerous. If an internal hordeolum doesn't drain and heal, it can turn into a chalazion. Unlike a stye, a chalazion is usually painless. A chalazion is sometimes confused with a stye, which also appears as a lump on the eyelid. A stye is a red, sore lump near the edge of the eyelid caused by an infected eyelash follicle. 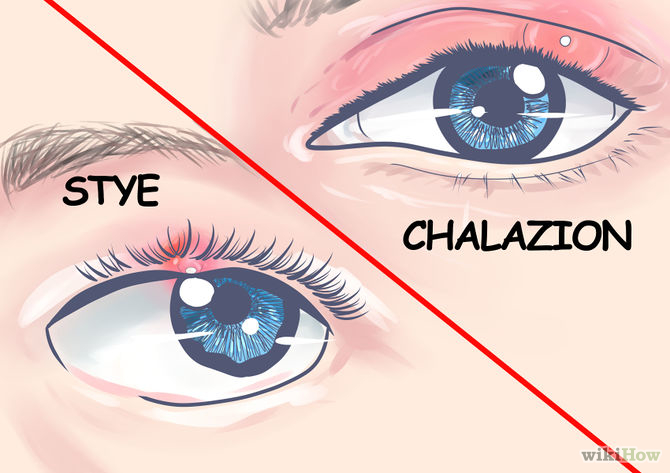 Chalazia tend to develop farther from the edge of the eyelid than styes. In some situations it may be difficult to distinguish between a chalazion and stye. What are the symptoms of stye and chalazion? Symptoms of a stye at first generally include eyelid tenderness and redness in the affected area, with irritation and scratchiness in the eye. About 25 percent of chalazia have no symptoms and will disappear without any treatment. Sometimes, however, a chalazion may become red, swollen and tender. A larger chalazion may also cause blurred vision by distorting the shape of the eye. 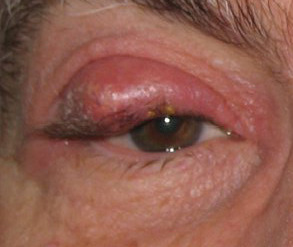 Occasionally, a chalazion can cause the entire eyelid to swell suddenly. How are styes and chalazia treated? Warm compresses. Warm compresses help to clear the clogged gland. Soak a clean washcloth in hot water and apply the cloth to the lid for 10 to 15 minutes, three to five times a day until the stye or chalazion is gone. You should repeatedly soak the cloth in hot water to keep it warm. The warm compress should allow the clogged gland to open and drain white or yellow discharge. If the gland opens, gently massage around the stye, or chalazion, to help it drain. Antibiotic ointments. 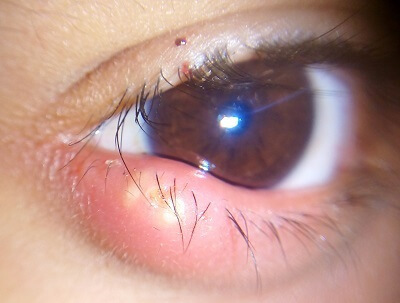 An antibiotic ointment may be prescribed if bacteria infect the stye or chalazion. Surgical removal. If a large stye or chalazion does not respond to other treatments or affects vision, Dr. Landa may drain it surgically. The procedure is usually performed under local anesthesia in his office. Chalazia and styes usually respond well to treatment, although some people tend to have them recur. If a chalazion comes back in the same place, Dr. Landa may suggest a biopsy (where a tiny piece of tissue is surgically removed and studied) to rule out more serious problems. Don't wear eye makeup or contact lenses until after the stye or chalazion heals. Who is at risk for developing styes or chalazia? · Have other systemic medical conditions, such as diabetes.